As the weather cools and the fall colors begin to show in early October, I'm often reminded off the mass snake migrations which take place in the Shawnee National Forest of southern Illinois. 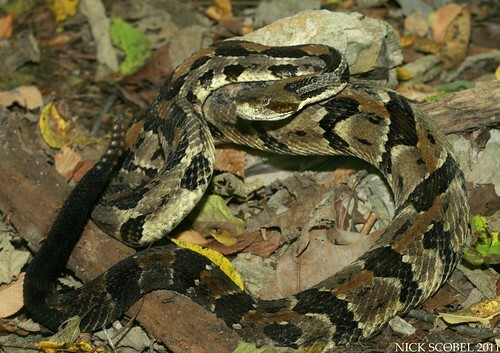 The famous snake road and its surrounding areas is one of the most impressive displays of biological diversity anywhere, as large numbers of more than 35 species of snakes begin to migrate back to their winter dens. I try to make it down to the area every autumn to find as many species as possible and to partake in the camaraderie of a campfire with close friends. Every year it seems as though I see something new, two years ago I was able to find a photograph a western mudsnake and last year I was able to finally see my first shawnee kingsnakes. Going into this year's trip, I set a few goals. First and foremost was the pit viper trifecta, something I hadn't seen in Shawnee since 2008. 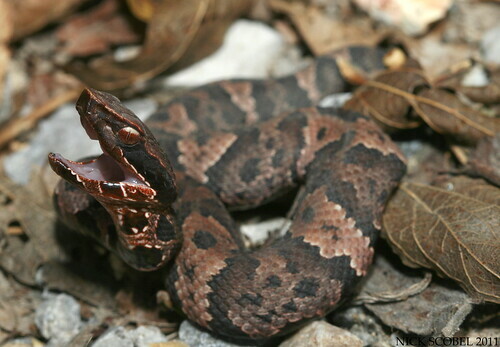 The trifecta is consists of the three venomous snakes in the area; the cottonmouth, copperhead, and timber rattlesnake. Secondly, I wanted to be able to find a mole salamander. The mole salamander is an odd Ambystomatid which reaches its northern range limit in southern Illinois & Indiana, it looks like a bloated smallmouth salamander with a shortened tail. And finally, I wanted to be able to find the last water snake species in the area I had yet to see, a diamondback water snake. Diamondbacks are present at snake road, but are probably the least frequently encountered of the Nerodia species. I was joined by Dusty Jordan and Chris & Colin Boguslawski on the trip, after a long drive and late arrival we were on our way bright and early on friday morning. We hit a few spots in the surrounding areas first thing in hopes of finding a kingsnake or black rat snake, but did not hit paydirt. We did however, find our first snake of the trip under tin at our last stop, a barn dwelling Nerodia. 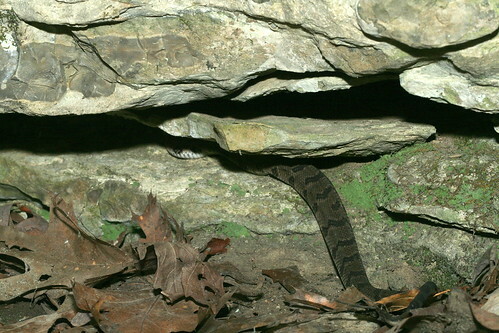 This snake is the most common of the Nerodia in the Shawnee National Forest, existing in almost every environment where there is water. This young individual had just finished shedding and was more than happy to cooperate for a few photos. A five-lined skink was also found on site, but nothing more. The sun had already risen quite a bit and temps were approaching the high 70s by late morning, so we decided to try out luck at snake road. We decided to start from the south end of the road but wanted to go check a salamander spot first, on our way to the spot we noticed this not far from the south parking lot. An adult male Eastern Box Turtle AT snake road. I've seen plenty of box turtles in the surrounding areas of the Shawnee National Forest, but have heard of very few, if any being seen at the road itself. This old, beat up fella was basking in the morning sun right off of the trail. 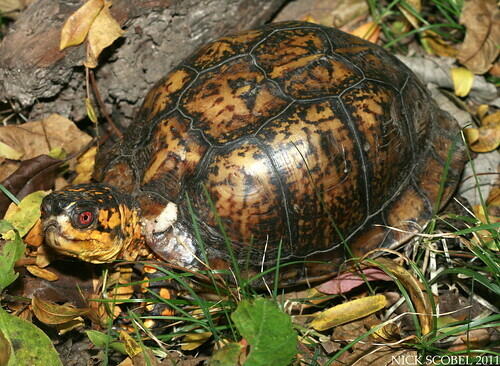 He appeared to have some significant injuries to his face, you can notice scar tissue and the absence of the beak which is characteristic to box turtles in the photo. It was also evident that he had sustained a pretty serious carapace injury in his lifetime as indicated by a large crack which had since healed quite well. It was pretty exciting to see one at the road itself, after a few photos we parted ways. A few minutes later, we noticed a small frog hopping off the trail and it ended up being our first of the three treefrog species that inhabit the area. 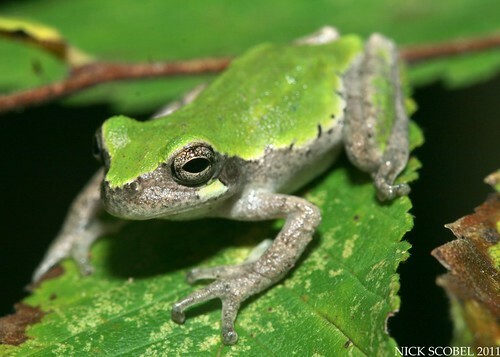 This small, brightly colored treefrog species reaches its northern range limit in the cypress swamps of southern Illinois. It can be almost identical to young H. versicolor but it lacks the bright yellow inner thighs characteristic of that species. While we were attempting to apprehend the frog, Dusty noticed a small snake between his legs and reached down to pick up this little gem. A neonate, this is the first individual I've seen in southern Illinois in several years. 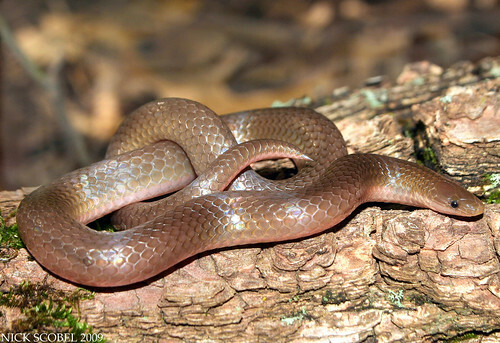 The earth snake is a secretive fossorial species which is only sometime found active on the surface, it is most often found under rocks and other types of cover. This would be the first of several seen on the weekend, but was the only one that I photographed. It was getting warm and with the success we had experienced early on, we knew we needed to get moving up snake road. 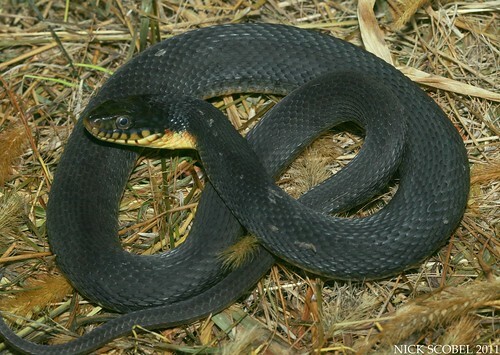 Several ribbon snakes were seen crossing the road, and a large Nerodia escaped off the side of the road into the swamp. Things were moving all over the place and that was encouraging. I walked along the bluff wall and found our first two cottonmouths of the trip; an adult & juvenile. The adult ducked into some thick cover, but the neonate hung out for a few photos. 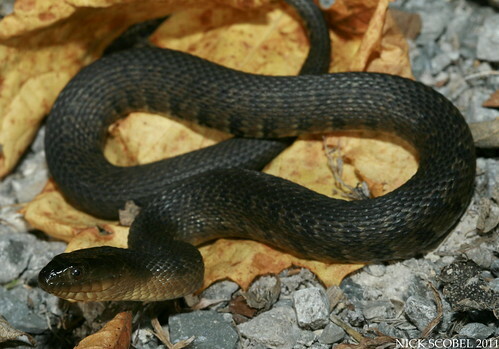 Several more cottonmouths were seen coming onto the road fresh out of the swamp and a large yellowbelly water snake was seen escaping into a thick stand of stinging nettle. Copperheads and timber rattlesnakes are around the area, but you often have to get off the beaten path to find them. We decided to head high in to the bluff slope to try out lock. Along the first area we climbed to we hit paydirt, with this unlikely pair basking side by side. 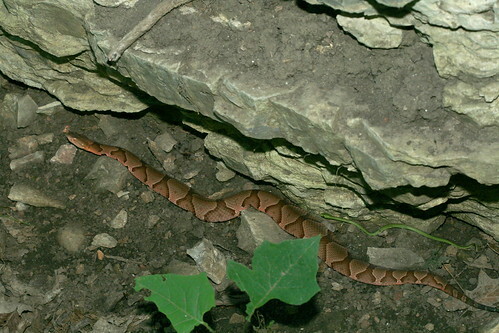 Copperheads from the Shawnee National Forest show some interesting characteristics from several different subspecies. This is due to the fact that the ranges of the northern (A. c. mokasen), southern (A. c. contortrix), and osage (A. c. phaeogaster) encroach on this region, giving genetic influence to the individuals from southern Illinois. 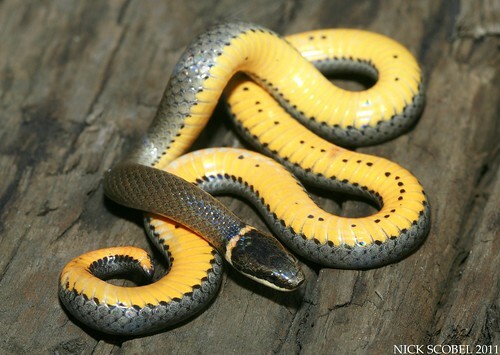 The slight white bordering to the chevrons on this snake is no doubt the influence from phaeogaster. Copperheads are extremely outnumbered by their close cousins at snake road and can be tricky to find but are still numerous in the area. After a long photo session, we parted ways and realized we were one step closer to completing the trifecta. The group stayed along the road and I decided to climb up to an area where I had seen snakes at in the past, along a large crevice in the bluff wall I noticed a small banded snake heading towards the bluffs, I was unsure of its identity from a distance. It was a juvenile timber rattlesnake, easily one of the smallest I've seen, with the exception being a neonate I found back in 2009 on a trip to Indiana, which you can read about in the blog post, The Hoosier State. I saw the boys heading further up the road so I yelled, "Timber!" I was able to scoop the snake onto a small stick to get it into the open for a few photos as I waited for the guys to climb the steep slope up to where I was. Based on the tiny button, this was a neonate born in the late summer. Timbers from the western part of their range can be similar in appearance to the "canebrake" form from the southeastern United States. 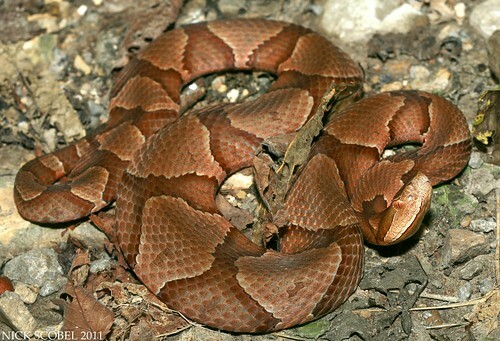 The more jagged chevrons, gray coloration, and rusty stripe along the dorsum are unique among the two geographic variants, although the individuals from the southeast tend to obtain a pink coloration on a more frequent basis. It was right around noon on the first day of the trip and we had already knocked off the trifecta, I couldn't believe our luck. We parted ways with the youngster and continued on, not too much later Colin got his hands on this lovely snake. This would be the first of more than a dozen green snakes seen on the weekend and this one was in perfect condition. 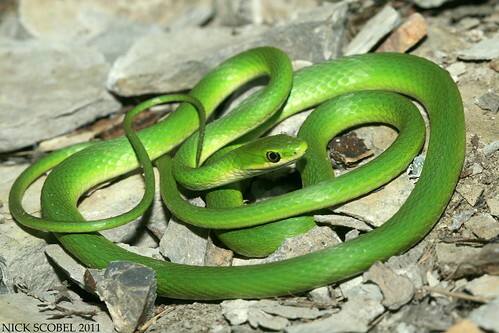 Rough greens are much more arboreal than their close cousins, the smooth green snake (Opheodrys vernalis). They are an active species with spends much of its time foraging for insects in vegetation. We observed them along the bluff walls, on the road, and in vegetation. We saw a few more common species over the course of the next few hours. We were joking that it would be nice to get a little bit larger timber, but we felt that we were being selfish. We checked out another spot that I know of that harbors rattlesnakes from time to time, there were several cottonmouths in the area but I noticed a larger snake layed out in the sun that looked different, sure enough we got out wish. This snake was a bit more impressive than the neonate we saw earlier in the day. A large adult well over the three foot range, likely a postpartum female. This was the seventh timber of the year for me and was one of the nicest looking individuals I've seen in the field. This snake drew the attention of a small crowd and was more than content to buzz away for a photo session. We parted ways with this snake and continued in, a member of our group found another snake I hadn't seen in southern Illinois for a few years. 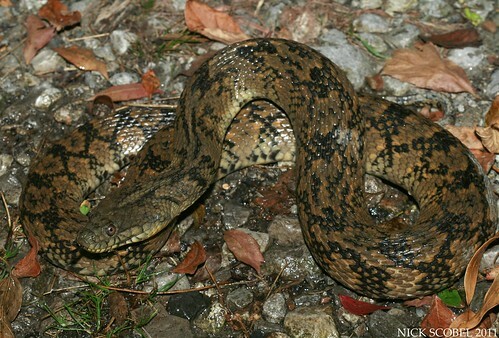 This species can be distinguished between other water snakes in the area by the presence of a subocular scale between the eye and supralabial scales. It is dark green, olive, or brown in coloration with faint narrow crossbands. It reaches its northern range limit in southern Illinois and is found in sloughs and cypress-tupelo swamps in the area, it is listed as a Threatened species in the state. As we were heading back to the car we flipped another interesting species, a first for me at snake road. 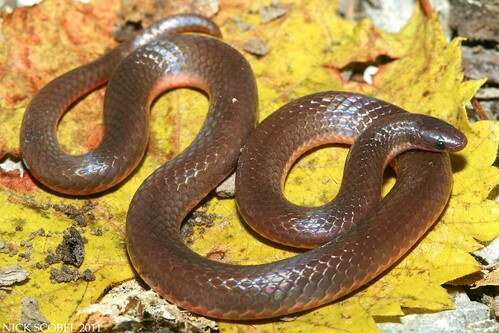 The worm snake is a fossorial species which is almost never found on the surface, it is usually found under cover such as rocks, logs, or discarded trash. It is usually found in wooded areas with rocky soils. This gorgeous adult was found under an unsuspecting rock near the south end of the road. The midwest subspecies boasts intermediate characteristics between the eastern & western subspecies. It is considerably darker than the eastern (C. amoenus) but does not have as dark of coloration or the deep red ventrals of the western (C. vermis). It was an excellent find and a great way to end our first day in southern Illinois. Road cruising proved to be unproductive that night, but we were up early on saturday and headed to a new location to avoid the hoards of weekend traffic at snake road. 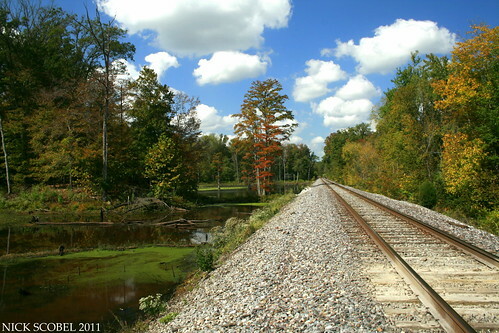 This area is familiar to many who visit southern Illinois and bisects a large cypress-tupelo swamp and is a home to a plethera of species. I saw a mudsnake at this site back in 2009 devouring a siren, the only example of each I've seen in the field. 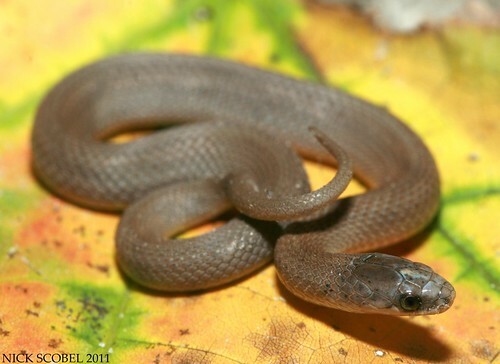 Not to far along the way, this beautiful neonate cottonmouth was found resting under a log near a known den site. 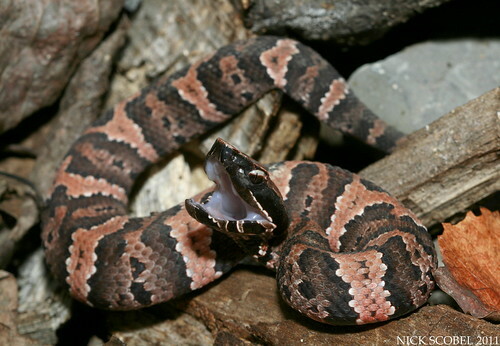 This may be the most attractive neonate cottonmouth I've ever seen, the picture really doesn't do it justice. Individuals in this area also seem to be much brighter in coloration in comparison to those at other places in southern Illinois. Further down the tracks I noticed a small snake basking on the ballast rock of the embankmet, turned out to be this sharp ringneck snake. Like many species in the region, Ringnecks from this area show a tremendous amount of variation. I've seen some individuals with a solid yellow belly, some with few spots like the one above, other with uniform spotting, and other with tons of scattered spotting. This is undoubtedly due to the influence of the southern, northern, and prairie subspecies which all encroach on this area of southern Illinois. Another green snake and several water snakes were seen along the railbed, but nothing more interesting than that. We decided to hit some of the lowlands in the area in hopes of finding some salamanders. We found one of that targets in large numbers very quickly. Marbled salamanders were once found in a few locations in Michigan, but haven't been seen since the 1960s and are likely extirpated from the state. 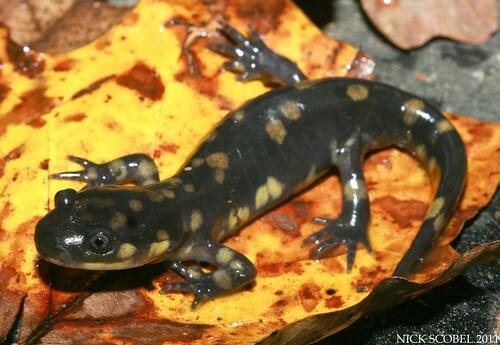 They are a fall breeding Ambystomatid that is rivaled only by the Ringed Salamander (Ambystoma annulatum) for appearance in the group in my opinion. We found ten or more individuals under cover in a lowland area. As we were leaving, Dusty flipped a log to reveal a species I've wanted to see for a long time. 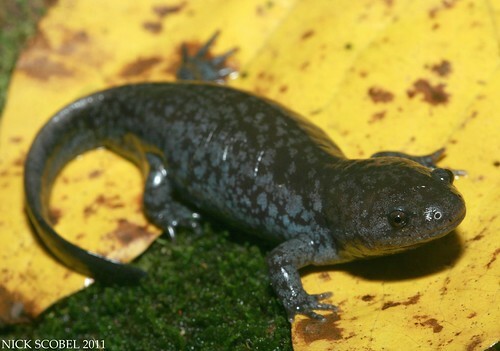 The Mole Salamander is uncommon in Illinois and only enters the southern tip of the state, reaching its northern range limit here and in southern Indiana. It is a denizen of cypress swamps and other lowland areas with where wet conditions are readily available. It is the odd member of the Ambystomatids, it has a short stocky body with a disproportionately large head and small tail. 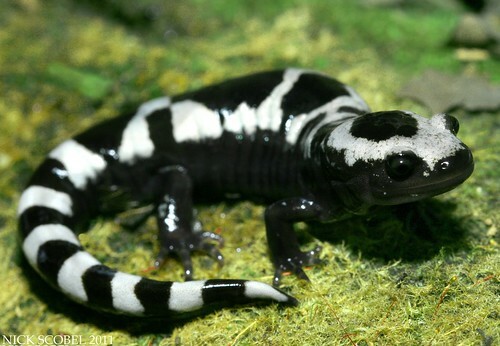 Like the marbled salamander, it is also a fall breeder and moves to lowland pools during autumn and winter rains. By this point it was mid-day, so we headed back to our campground after poking around a very crowded snake road for awhile. That night, we decided to head to Cape Girardeau, Missouri across the Mississippi River for some dinner. As we were driving, we swerved to miss a very large snake coming onto the road, I was elated when it was a species I hadn't seen before. This was an extremely nasty snake. Upon picking it up I was bitten repeatedly, defecated on, and musked in a matter of a few seconds. A large, grumpy, stinky snake. I had not admire it though, as this species was a lifer for me. 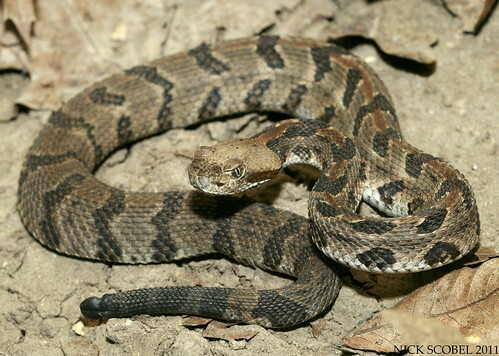 Diamondback water snakes are common near river bottoms and other lowland wetlands in southern Illinois, and this one was found crossing right by a river bottom. After a few quick photographs, we were off to enjoy a nice steak dinner and watch Michigan blow out Northwestern in the second half 42-24. We later returned to our campground and began gathering firewood, a log revealed this surprise. A young eastern tiger salamander right in the campground. I had never even heard of any tigers being found in this region of Illinois, it was a great find. We photographed the animal and then enjoyed one last campfire before heading home the next day. Once again, the long drive to this natural wonder had payed off. I'm sure this time next fall I will be back once again, that's all for now. Until next time, keep warm!